I found this incredibly beautiful craft idea posted on Tumblr (no idea of the original source sadly), and had to share it! 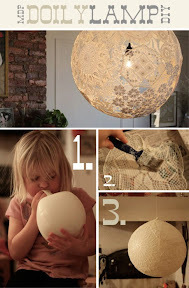 Basically, blow up a balloon, coat a doily in paper mâché paste, let dry, pop and thread a lighting fixture through! Beautiful decor idea! Thank you much! I'll add it to the post later today! Wow! I'm totally doing this!! !